You can achieve perfectly crispy roasted potatoes every single time with one simple trick! Your roasted potatoes never tasted so good! If you were like me, you’ve probably spent your entire life roasting sub-par potatoes. I’d chop them up, haphazardly toss them in oil (maybe) and then stick them straight into the hotbox for an indeterminate amount of time until they were somewhere in-between underwhelming and fossilized. It never occurred to me there would be a better way to roast potatoes, other than, you know, to just roast them! What if I told you there was a secret to getting perfectly crispy roasted potatoes every time? It’s true! I don’t remember where I learned this trick, but I have never roasted potatoes any other way since! Not all potatoes are created equal. Red potatoes and Yukon golds get tender and creamy when roasted, but will never achieve that crisp roasted crust. Within minutes of removing them from the oven, the skin will soften into a more homogenous texture. Still tasty, but not crispy roasted potatoes. Instead, the best potatoes for roasting are Russet potatoes, also commonly known as baking potatoes. These are the same potatoes used to make fluffy mashed potatoes, and French fries. When tossed in oil the exterior crisps up beautifully and stays crisp long after they have been removed from the oven. 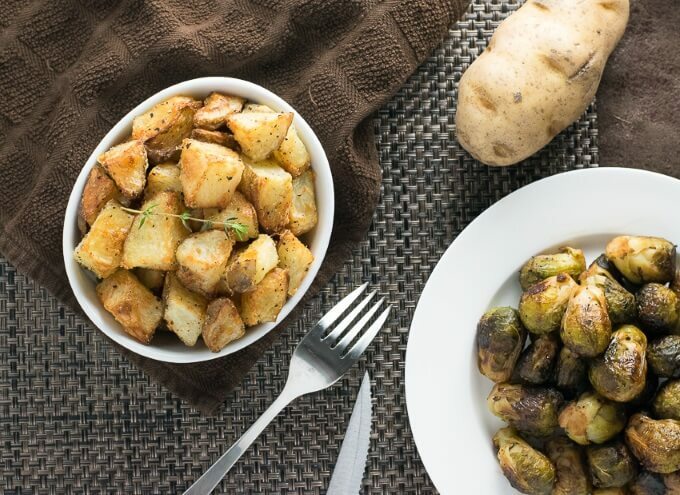 So, what is the Secret to Perfectly Crispy Roasted Potatoes – Boil the potatoes you’re roasting! Yes, I know that seems completely counterintuitive, but it makes perfect sense. Parboiling the potatoes softens the exterior which allows you to scuff up the exterior of the spud easily. Why does this matter? Scuffing creates more surface area! The more surface area your potatoes have, the more there is to crisp up while roasting! All those soft jagged bits and pieces sticking out will turn into delectably crispy and crunchy bites! If I can offer you one more tip, it is to roast your potatoes on a Non-Stick Baking Mat (affiliate link). I love using mine because it is easy to clean, nothing sticks to it, and I don’t have to worry about ruining my good baking sheets if something burns on. Traditionally, potatoes are often roasted in an oven set to 400-450 degrees, however, for maximum crispiness you want a screaming hot oven. 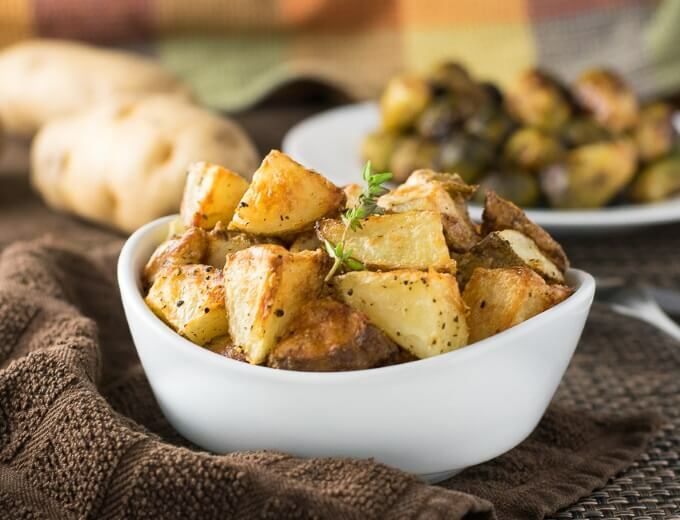 Cut the potatoes into 2″ chunks and roast at 500 degrees for 40 minutes. You can cut the potatoes smaller if you wish, just plan on them getting done quicker. Add cold water, 1 tbsp vinegar and ~1 tablespoon salt to a pot. Add the potatoes, bring the water to a boil and reduce to a simmer. Par-cook potatoes until the exterior is tender but the inside is still slightly firm when pierced with a fork, about five minutes. Drain the potatoes from the water in a colander, shaking occasionally to scuff of the exterior of the potato. This creates more surface area to crisp up during baking. Add potatoes to a large bowl, add oil, and salt and pepper generously to taste. Mix with a metal spoon if your colander didn't adequately scuff the potato's exterior. Place potatoes evenly on a baking sheet and bake at 500 degrees for 40 minutes, or until crispy. Flip potatoes with spatula halfway through cooking. Taste for salt, adding more as needed and serve! IF YOU LIKED THIS RECIPE be sure to check out How to Roast Sweet Potatoes too! This recipe was originally published December 11, 2015 on FoxValleyFoodie.com. If you enjoyed The Secret to Perfectly Crispy Roasted Potatoes then you should probably like me on Facebook and follow me on Pinterest too. That’s what I would do at least, because if you don’t get to know me but you still use my recipe it is kind of like taking candy from a stranger, and your mom taught you not to do that. Don’t disobey your mom, subscribe to Fox Valley Foodie today. We used to do that at the restaurant I worked at all the time so, yes, it works! Great pics, the potatoes look yummy. Don’t they taste so much better too!? This post is a keeper for everyone who is constantly ending up with soggy or burnt potatoes. Awesome, and easy to follow! Thank you! this sounds like a great technique adjustment for me to make on my thyme/rosemary potatoes, thanks! Well, if you want REAL crispy full of flavour, roast potatoes, then after parboiling, use duck or goose fat and set oven to quite a high heat, as in around 230C (450F), turning once or twice. These were way better than anything I’ve ever made!